I became a big fan of Halcyon Gourmet back when they were on my walk home from the subway station. Then late last year, they moved to a bigger location a little bit further from me, and I kept forgetting to go check it out. Until I got sick, developed slight cabin fever, and had no desire to cook anything. 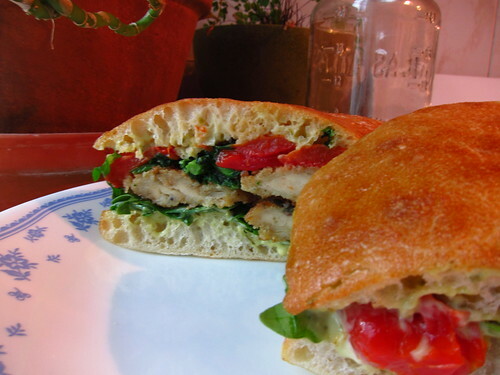 Through the wonders of Twitter, they enticed me with their March special sandwich: Pecorino chicken cutlet with broccoli rabe, red peppers, and pesto mayo on ciabatta. I can put pants on for that. 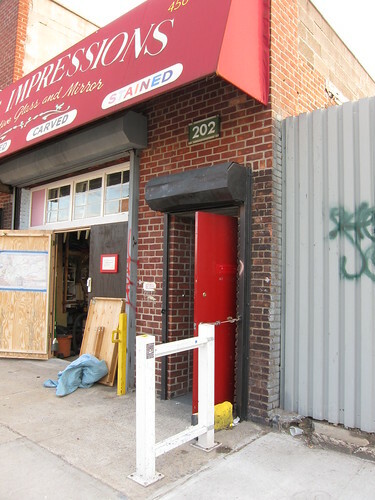 The new Greenpoint kitchen is located on Banker St between Norman & Meserole, under an awning saying "Glass Impressions". This threw me off a bit, but luckily I knew the address and saw their chalkboard and red door. After a short wait, my freshly made sandwich was ready! The delicious crusted chicken cutlet, the creamy mayo, and crusty Ciabatta made for one awesome sandwich. I have a soft place in my heart for breaded chicken cutlets, but eating this with brocolli rabe and peppers made me feel like a grown-up. And since the sandwich is less than $10, it made me all kinds of happy. When you go, be sure to pick up their peanut butter bliss cookie sandwich. It's to die for. So good there are no photos. Also, if any of you need Easter treats, they're selling some here. "I can put pants on for that." May be one of the funniest lines I have read... I'm glad you enjoyed your meal and hope you are feeling better!